I’ve got quite a few different ways to make Sloppy Joes using mushrooms, black beans, and even cauliflower. But THESE Sloppy Soy Curls are about the BEST ones I’ve tasted yet. And the best part? They’re super quick to make! One of my readers emailed me and suggested more fast and easy recipes for people who work all day and don’t feel like slaving over a stove when they get home. These Sloppy Soy Curls are just for you! I was there myself yesterday as it was getting late, I was tired from working outside, and I knew everyone was hungry. I opened the pantry and spied a bottle of Stubbs BBQ Sauce, and there on the counter was a bag of Soy Curls…. I thought…..could it actually be that easy? Not only was it easy, it was delicious! AND…..dinner was ready in less than 30 minutes. And if you’re questioning the Stubbs BBQ Sauce, yes – it DOES have pure cane sugar as an ingredient, but it’s one of the few store-bought sauces I’ve found that does NOT have HFCS. Of course you could always make your own sauce, like I did in these homemade BBQ Soy Curls, but hey…you wanted quick and easy right? Start by rehydrating your Soy Curls. Add 3 cups of dried Soy Curls to a large bowl and just enough hot water (about 2 cups) to moisten them. You don’t need to completely submerge them, but just enough to allow them to start rehydrating. If you see some dry ones poking out, give them a good stir to redistribute. Add 2 Tbs of Low Sodium Soy Sauce to flavor, and optionally a little garlic and onion powder, and set aside. Meanwhile, add ½ finely chopped Onion and a finely chopped Green Bell Pepper to a sauté pan. Add a splash of Low Sodium Veg Broth just to keep things from sticking, and sauté over med-low heat until the onions begin to soften. Add a teaspoon or two of minced garlic, and another teaspoon (or more) of finely minced jalapeño, and give that a stir. Drain any water that’s left in your bowl of soy curls and toss the soy curls onto a cutting board. Chop the soy curls, especially the big pieces, until they resemble the consistency of ground beef, then add them into the pan with the veggies. Add an 8oz can of Tomato Sauce and give that a stir. Now let’s add the Stubb’s Original BBQ Sauce. What I like most about this particular sauce, is they use NO HFCS (High Fructose Corn Syrup) at all, where just about every other brand has that as its very first (and main) ingredient. Back to the Sloppy Soy Curls…. Add as much BBQ Sauce as you like (I used about ½ a bottle of Stubb’s) , and I like to also add a splash of Red Wine Vinegar (maybe 1 tsp) and stir thoroughly. It may look thin and watery due to the Tomato Sauce, but that’s ok, it will thicken. Simmer over medium-low heat until it reaches your desired consistency….like I said, it will thicken as it cooks down. Serve open-faced over your favorite roll, bun, or bread and top with whatever garnishes you like. I like a few extra jalapeños myself, but a few slices of dill pickle would be good too. These sandwiches would be great for that summertime picnic, served up alongside some BBQ Beans, Vegan Potato Salad, or my oil-free Pasta Salad. I’ll include the links to Butler Soy Curls and the Stubb’s BBQ Sauce below. Keep in mind these are affiliate links, meaning I receive a small commission for every purchase you make. Thanks and enjoy the picnic! Trying to cut red meat out of your diet? 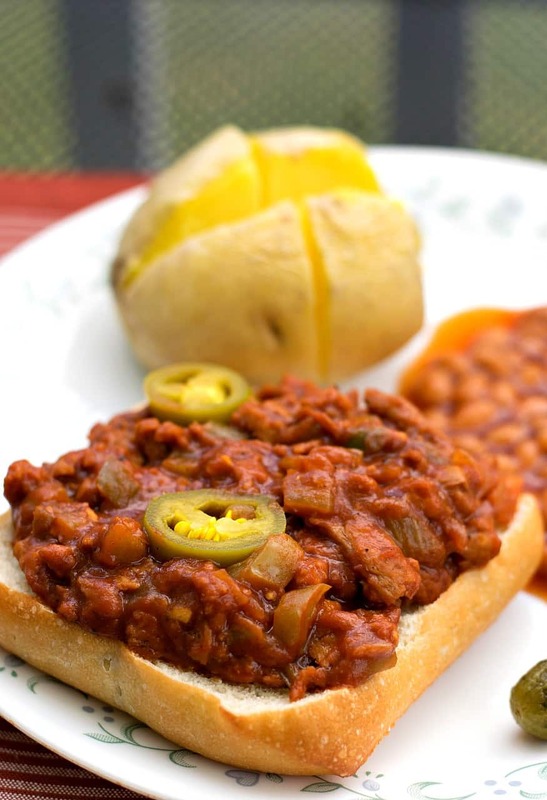 These Sloppy Soy Curls are a fast and delicious alternative to hamburger-based Sloppy Joes. Add dry Soy Curls, hot water, and soy sauce to a large bowl and set aside. Stir occasionally. Drain soy curls, squeezing out any excess water, and chop finely. Add to pan with veggies and stir. Add Tomato Sauce, BBQ Sauce, and Vinegar and stir. Simmer over med heat until reduced to desired consistency. These look really yummy! That sauce looks delicious! BBQ Soy Curls is a huge favorite of mine. I love how soy curls lend themselves to so many different flavours. This looks great! I like that particular BBQ sauce as well. I haven’t tried that brand of soy curls so I’ll have to try it! 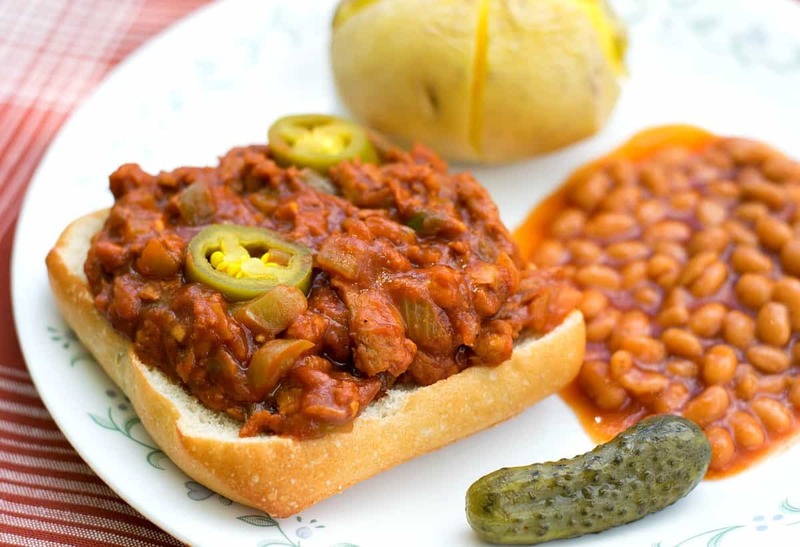 there is something mysteriously comforting about sloppy joe sandwiches, probably because just about every grade school served them. happy you were able to turn this into a vegan friendly meal! I made these sloppy Joes and your potato salad for supper. We are so happy with your recipes! Thank you!